We strive for excellence. We deliver integrity, and Professionalism in clinical care. Our surgeons have over 10 years experience in Cosmetic and General Plastic Surgery. We deliver a personalised, individual and highly specialised approach to Cosmetic Breast surgery. 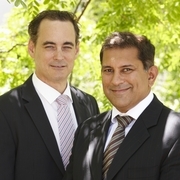 Dr Mark Hanikeri and Dr Rohan Page completed their medical training at the University of Western Australia They each obtained the qualification of Fellow of the Royal Australian College of Surgeons (FRACS, Plastic and Reconstructive Surgery) in 2003. They each completed a further 1-2 years of post fellowship training in the UK and the USA. Drs Hanikeri and Page established a private practice in Perth in 2005 and were founding members of the Western Australian Plastic Surgery Centre. They are fully accredited Consultant Plastic Surgeons at St John of God Hospital in Subiaco, Murdoch and Bunbury, in addition to Hollywood Private Hospital, Bethesda and The Mount Hospital. They are also Consultant Plastic Surgeons at Sir Charles Gairdner Hospital and provide a visiting Plastic Surgeon servicing to Albany, Bunbury and Dunsborough. They are regularly involved in undergraduate and postgraduate surgical training. Sólo tienes que subir tres fotos estándar ahora para ver una simulación 3D en tu próxima cita con Dr Mark Hanikeri & Rohan Page. Visualiza tu cuerpo o rostro actual en 3D antes de la consulta y obtén acceso desde casa a tu nueva imagen después de la consulta para poder compartirla con amigos y tomar una mejor decisión. Después de la consulta, Dr Mark Hanikeri & Rohan Page puede darte acceso para ver tu "nuevo yo" desde casa, con tu propia cuenta Crisalix. Esto te permitirá compartirlo con tu familia y amigos o con cualquier persona a la que quieras pedir opinión.